It’s currently 2am and I’m exhausted so I’m uploading and writing this post as fast as I can so I can go to sleep because my babies are going to wake me up bright and early. So here’s a quick hello, have a wonderful day and thanks so much for stopping by. Love you all!! Fantastic outfit, you’re looking flawless!! This color palette is the perfect mix of feminine and soft. Such a great start to the spring season. Bored of the colors. Those mountains are great tho, do you guys hike up there? Love that jacket! The military style is so chic! hopefully you get some more sleep! Love this look. Love that blazer, such a great color! Thanks Taylor!! I know, I’m obsessed! Gorgeous outfit! The pink of the blazer is very subtle and I love it. The jeans also look amazing on you. Just wanted to let you know how much I love your sweet and sunny posts – what a little burst of positivity and cute inspirational ideas! I look forward to them each and every morning! You and your adorable family are just a breath of fresh air; and your style is adorable!!! Thank you for all you do – and BEST OF LUCK with your business, you have got it, girl, you are onto something wonderful! I see the next Tory Burch!!! Love seeing you succeed! Ok, this was the nicest thing to wake up to and read this morning!!! Seriously, thank you so much. I appreciate the love and support! I hope you have the best Thursday! Oh, Rach, I hope you’ve gotten some rest! You look gorgeous in these photos, I adore that blazer and it looks so good paired with those jeans. I really need to start to check out Levis because I’ve yet to own a pair! Thanks for sharing and I hope you have a great day! You are so sweet!!! Congrats on your little one! Being a mama is the absolute best. Love that blazer! Such a great look! 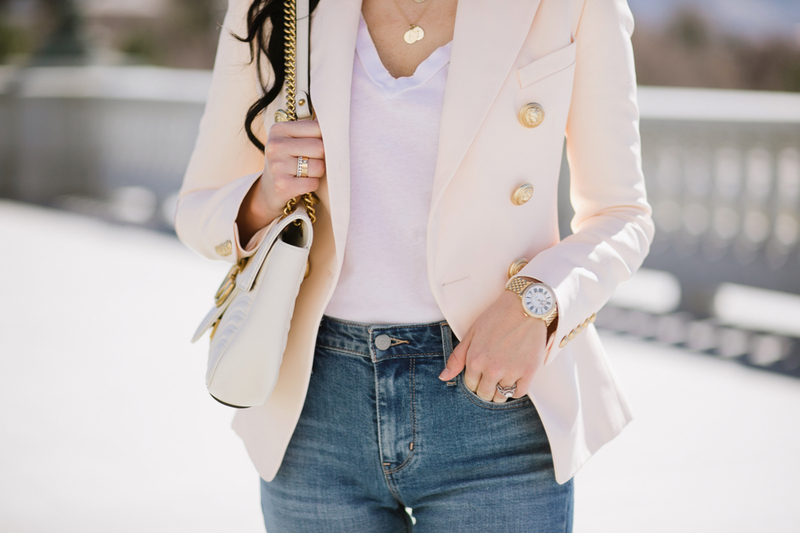 I love this blazer, it’s so chic! Rach, this outfit is beautiful and so chic on you! A popular look with bloggers. Looks great! WHBM has a similar, more affordable jacket in this style. Those are my favorite jeans! I have them in 4 different shades but the distressed are definitely my favorite! You look great! You always look perfect in pink. LOVE your bag. Thank you Davida!! You’re sweet! Love this look! Does the blazer run true to size? They really are!!! I linked up some more affordable options too :) Thanks for stopping by! I really love how subtle the pink on this blazer is. It’s clearly pink without being in your face and that somehow ties together the whole outfit really well. You look SO chic. that blazer is insane! love this outfit! so simple, effortless and chic! Totally in love with this look! I wear jeans, blazers, and heels a whole lot. It’s an eazy but stylish look to pull off! My fave! Your blazer is gorgeous! Love that you paired the beautiful jacket with the distressed jeans, giving an edgy look! I’m obsessed with the Balmain blazer – the structure is incredible!! Is it comfortable?? Pink is definitely like the dynamic new neutral. 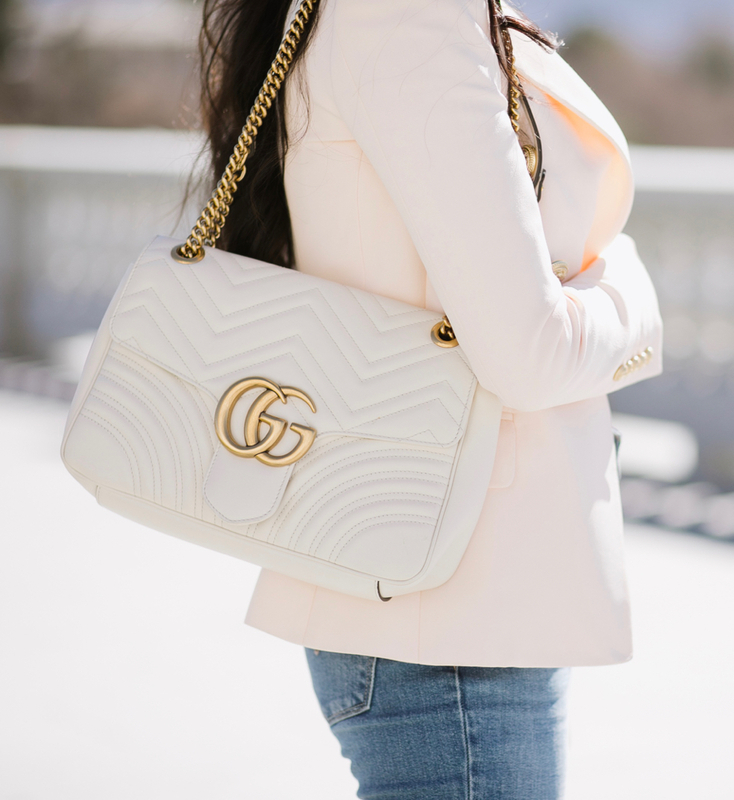 Blush goes with anything. That blazer is seriously stunning! It’s such a beautiful colour and it such a flattering style on you! Loving all things blush at the moment! 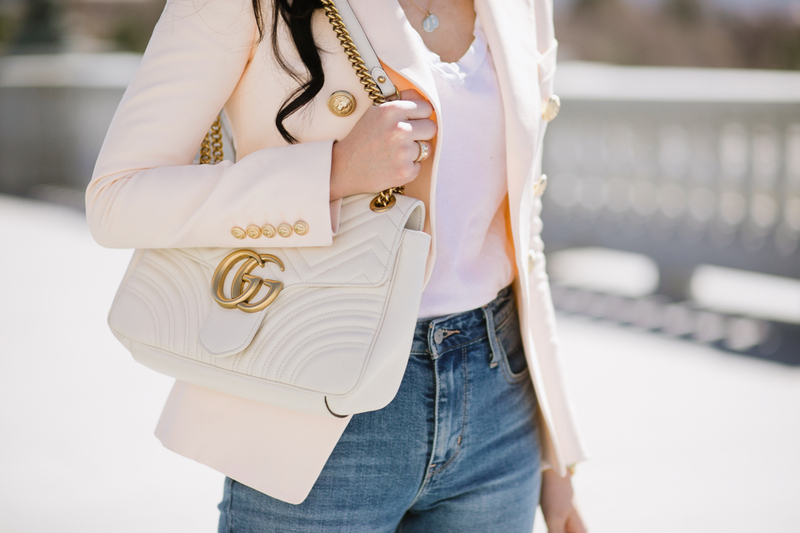 I love the look such a beautiful blazer, it’s a outstanding outfit’s i never seen before the jeans is very rocking look and the blazer is very comfortable and great color. thanks for sharing Gorgeous looking outfit’s. I absolutely love this outfit ?? you look amazing as usual ? Thank you Genevieve!! You are so sweet!